Event Description: A fun and fascinating site for a corporate team building event, the American Natural History Museum — sitting sturdily on 79th Street and Central Park West — is a true New York institution. Who hasn’t gotten lost in its labyrinthine hallways and galleries, stumbling onto wonders from dinosaurs to insects to meteors? 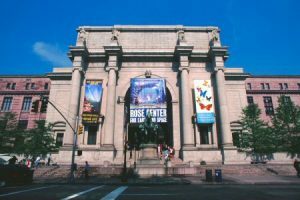 Far more than a playground for the little ones, the AMNH is also a superior treasure hunt location — jam-packed with signage, exhibits and attractions that we have “brought alive” in this hunt. It’s also an IDEAL INDOOR HUNT LOCATION for inclement weather, whether it’s cold and wet or hot and sweaty. During your corporate team building treasure hunt…expect a fascinating day of exploration on all four levels of the museum, as you journey from the Stone Age to the Age of space flight, with lunch at the terrific museum cafeteria. Admission not included in program fee.